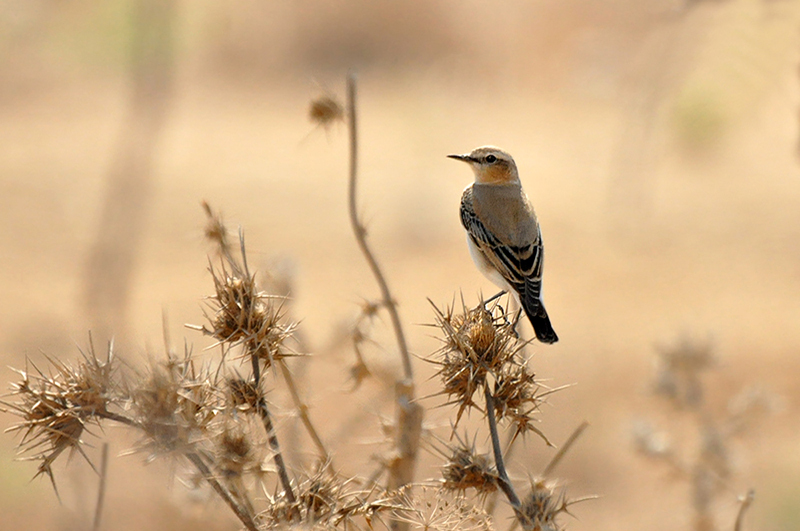 The Northern Wheatear makes one of the longest journeys of any small bird, crossing ocean, ice, and desert. It migrates from Sub-Saharan Africa in spring over a vast area of the Northern Hemisphere that includes northern and central Asia, Europe, Greenland, Alaska, and parts of Canada. In autumn all return to Africa, where their ancestors had wintered. Northern Wheatears first breed when they are one year old. The nest is built entirely by the female while the male perches nearby, sings and sometimes performs song-flights. The eggs are very pale blue in colour and sometimes have a few red-brown marks at the larger end. The eggs hatch after approximately 13 days. The chicks are fed by both parents and are brooded by the female for the first five or six days. They fledge after 15 days and become independent of their parents when they are between 28 and 32 days old. Lovely bird, migrating every summer also in Romania, in my region too. Excellent details and focus as usual. An excellent photo and scene of this bird surrounded by a warm atmosphere. Very good photo and beautiful bird. Well captured this Northern Wheatear. Nice background and well placed bird in the frame to show its natural habitat. Hi Peter! It's great to see you back on TN! Now that I have a Tamron long lens, I can appreciate the quality of a bird image it can achieve by looking at your superb image of this bird you shot with this lens in Cyprus.